On day two of cooking school we made smoked chicken. I was in heaven! The chicken was soaked in a brine overnight and then covered with a BBQ rub. We smoked the chickens outside on the grill. I skipped going outside because it had started to rain a little. 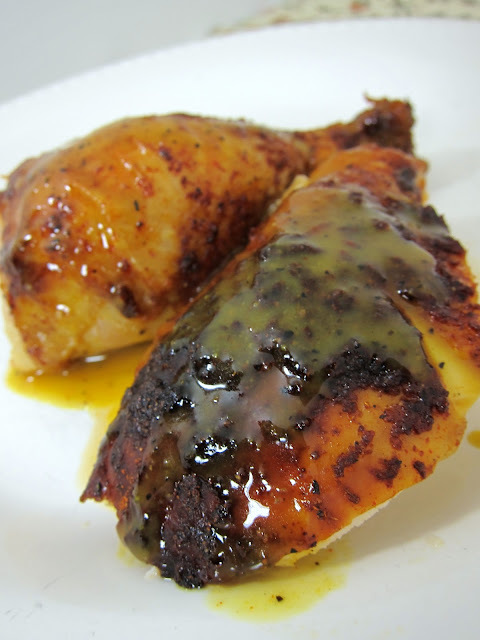 While the chickens were smoking we made a honey mustard BBQ sauce that was fantastic! This chicken was one of my favorite dishes at cooking school. I cleaned my plate! Our grill at home isn't tall enough to smoke chicken, so I decided to roast it the oven. I used my Pampered Chef stoneware Bundt pan as a vertical roaster. It is perfect for roasting chicken because it doesn't have a hole in the top of it - the drippings all go in the pan and not in the oven. The brine is full of amazing flavors - lemon, orange, grapefruit and fresh rosemary! We let the chicken hang out in the brine for about 24 hours. We used a 2.5 gallon ziplock bag and sloshed it around every few hours. 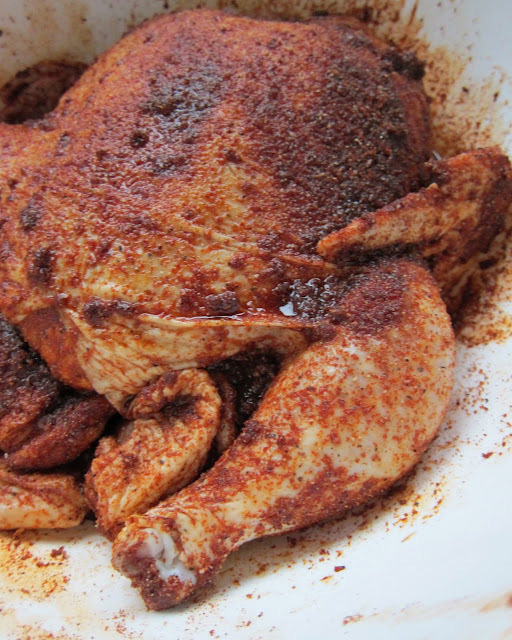 About an hour before we started cooking the chicken, we rubbed the chicken with the BBQ rub. We baked the chicken at 400F for about 1 1/2 hours (our chicken was almost 5 pounds). Here is what it looked like when we took it out of the oven - see all the drippings! The final product was amazing. It was just as good at home as it was at The Ritz Carlton. We both loved every bite! Heat 2 cups of water in a small pot with salt and brown sugar until salt and sugar dissolve. Allow to cool for 5 minutes. Toast the peppercorns and juniper berries in a small pan for about 30 seconds until fragrant Crush the peppercorns and juniper berries with mortar or flat part of knife. Smash garlic cloves. Place chicken in large bowl or ziplock bag. 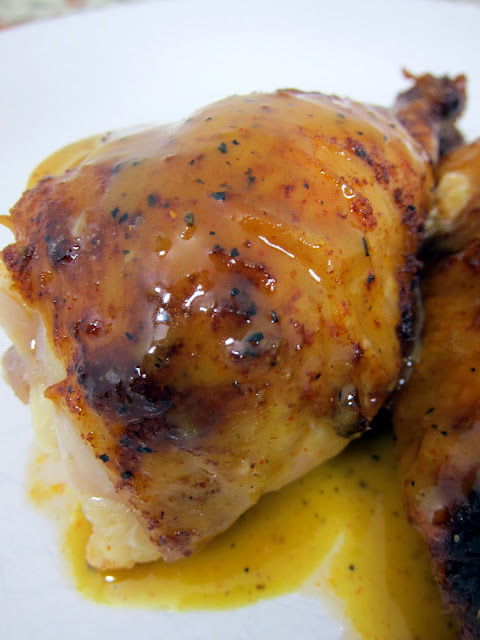 Cut the citrus in half and squeeze over chicken, and drop the citrus over the chicken. Add garlic, spices and herbs. Pour remaining water and dissolved salt mixture into bowl or bag. If your chicken floats, weigh it down with a plate. Cover and refrigerate 8-12 hours. Flip chicken every few hours. 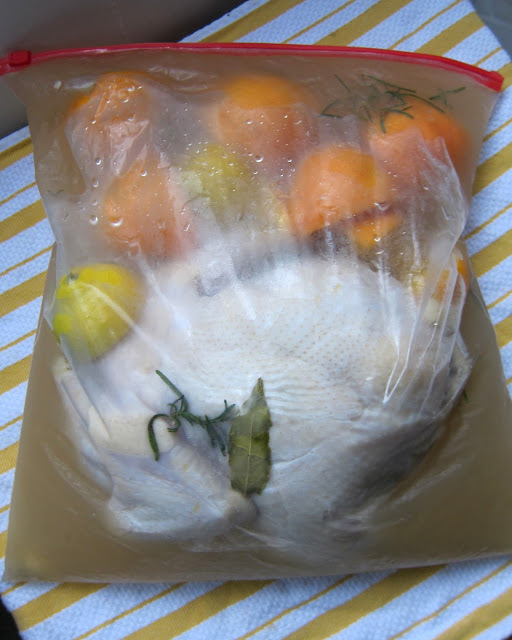 Remove chicken from brine and pat dry with paper towels. Place all ingredients in a non-reactive bowl and mix. Place chicken on a clean dry surface or large bowl and sprinkle the rub on the meat, turning to get the whole chicken covered. Preheat oven to 400F. Place chicken on vertical roaster/Bundt pan and bake 60-90 minutes, until internal temperature reaches and holds at 165 F for 30 seconds. 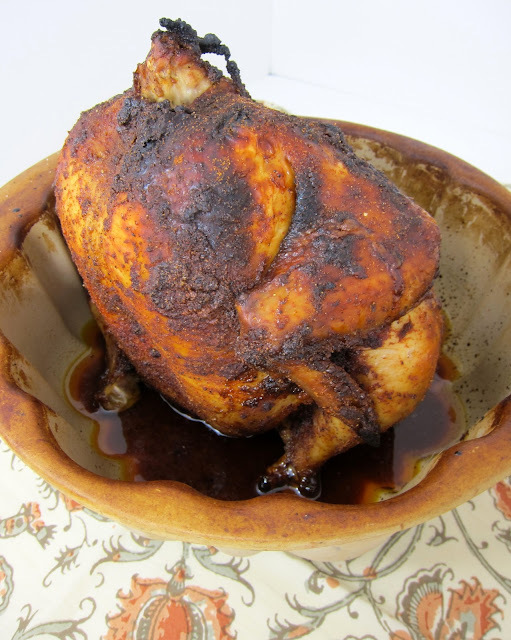 Allow chicken to rest for 5 minutes and serve with BBQ sauce. Combien all ingredients except Worcestershire and butter in a saucepan and simmer for 10 minutes. Remove from heat and stir in Worcestershire and butter. Keep cold. ok, is it possible for you to fedex this to me in time for lunch? That is one seriously delicious looking roasted chicken. Wow!! this look sooooooooo good! I'm salivating just looking at that! This made me instantly hungry! Looks absolutely delicious. It looks like it turned out perfectly and the sauce, dripping onto the plate is appealing. You could always spatchcock or butterfly the chicken to get it on your grill.